In late December 2008, coinciding with the onslaught of Israel’s “Operation Cast Lead” directed against Gaza, the Pentagon dispatched some 100 military personnel to Israel from US European Command (EUCOM) to assist Israel in setting up a new sophisticated X-band early warning radar system as part of a new and integrated air defense system. (See defense.gov/news/, December 30, 2011). The project had been approved by Secretary of Defense Robert Gates in September 2008. With media attention focussing on Gaza, this crucial military initiative in the area of US-Israel Air Defense passed virtually unnoticed. The official story was that Tel Aviv had requested this aid “to help defend against a potential missile attack from Iran”. What was at stake, however, was a new threshold, a fundamental turning point in the structure of Israel’s Air Defense system and its relationship to the US global missile detection system. “Once fully operational, the system will be capable of tracking and identifying small objects at long distance and at very high altitude, including space, according to U.S. Missile Defense Agency officials. It also will integrate Israel’s missile defenses with the U.S. global missile detection network. The X-band radar would “integrate Israel’s missile defenses with the U.S. global missile detection network, which includes satellites, Aegis ships on the Mediterranean, Persian Gulf and Red Sea, and land-based Patriot radars and interceptors.” (Ibid) . 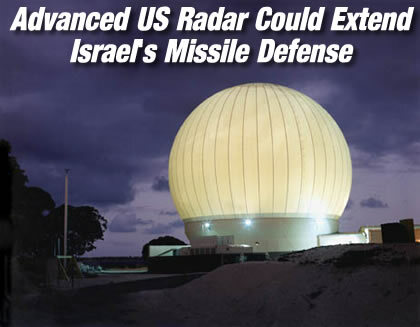 According to a July 2008 report by Stratfor, the use of the more advanced X-band radar system would enable Israel to be more effective in the use of its Arrow and Patriot missiles (in comparison to its Super Green Pine radar system). The Pentagon asserted –in no uncertain terms– its central role in overseeing Israel’s air defense system. US officials were clear as to the nature and ownership of the X-band radar project. ”This is and will remain a U.S. radar system,’ Pentagon spokesman Geoff Morrell said. ‘So this is not something we are giving or selling to the Israelis and it is something that will likely require U.S. personnel on-site to operate. '” (Quoted in Israel National News, January 9, 2009, emphasis added). In practice, since 2009, the US military controls Israel’s Air Defense system, which is integrated into the US global missile defense system. Under these circumstances, Israel cannot launch a war against Iran without the consent of Washington and the involvement of of the Pentagon. This Israeli-US integration in the area of air defense is part of an evolving process. It is part of a pattern of bilateral military cooperation which has unfolded since the launching of the joint US-Israel Arrow Weapon System (AWS) in 1986. The AWS is a cooperative venture between Israel’s Defense establishment and the U.S. Missile Defense Agency. It was developed as a joint venture initative between Israel’s Aerospace Industries (IAI) and Boeing. IKt is, however, largely funded by the the United States. There has been a significant hike in US military aid to Israel. In fact much of this so-called military aid constitutes a veiled increase in the US Defense budget. Large shipments of US ordinance to Israel were ordered at the very outset of the Obama adminstration. A large part of these shipments, while officially tagged as “military aid to Israel”, are part of a broader weapons arsenal under the (direct or indirect) control of the Pentagon. This reinforcement of Israel’s missile defenses combined with the large shipments of US weapons should be viewed as part of ongoing war plans directed against Iran. According to a report by Israel’s National News (December 23, 2011), the US Senate and House of Representatives Appropriations Committees have approved a massive increase in US military aid to Israel. This aid is officially earmarked for the development of Israel’s anti-missile system. “The United States will double the special aid it gives Israel for the development and implementation of anti-missile systems, the Globes financial newspaper reported on Thursday. According to the report, the House and Senate’s Committees on Appropriations approved the aid following a request by the U.S. Administration to approve aid totaling $106.1 million for the Arrow 3 anti-ballistic long-range air defense system, for the program to improve the basic capabilities of the Arrow systems, and for the David’s Sling mid-range anti-missile system. This latest allocation is casually identified as military aid to Israel, when in fact its ultimate objective is to reinforce US-NATO-Israel’s strike capabilities directed against Iran. The two were only expected to shake hands following Obama’s speech, however in light of recent events in the Middle East – particularly the Iranian nuclear threat – Obama and Barak retired to a nearby conference room and spoke for nearly half an hour. Obama also remarked that Israel and the US see eye to eye from an intelligence point of view. 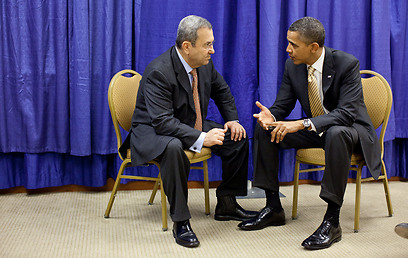 Barak mentioned that at this point in time the world is focusing on taking diplomatic measures against Iran, especially by increasing the sanctions on Tehran. Meanwhile, the Obama administration has reached an understanding with Congress in regards to carrying out sanctions against Iran’s Central Bank.